Help! My Kid Won’t Eat Healthy Food! Home/Blog, Uncategorized/Help! My Kid Won’t Eat Healthy Food! Getting kids to eat healthy food is the one of the greatest challenges parents face in this junk food filled world we live in. The daily tsunami of advertising and exposure to non-food is mind boggling. So it’s not a huge surprise when exposed to this type of “food” that children begin to crave an exclusive diet of it. Remember, the fast food industry has spent a fortune researching the perfect combination of fat, salt and sugar to create foods that will set up huge cravings for it. So how do you get your child to enjoy and actually crave nutritious food? Well, the answer lies in modeling parents’ food choices and the exposure to good wholesome nourishment. Children love to help Mom! You can’t expect your little ones to eat their vegetables if mommy and daddy don’t eat them can you? Parents are the ones who set the example and buy the food! One way to help children develop a palate for healthy food is through gardening. My tiny great nephews love to eat food out of their little back yard garden. In fact, Liam who is 2 ½ is in charge of collecting salad greens for lunch and dinner and is his mom’s helper when making green juice. Yes, he and his baby brother Luke love green juice! If a backyard garden isn’t possible, then taking kids to farmers markets and supermarkets are other options. Exposing children to the incredible beauty and abundance of fruits and vegetables and allowing them to select and help prepare food are great ways to instill in them a lifetime of healthy food choices. 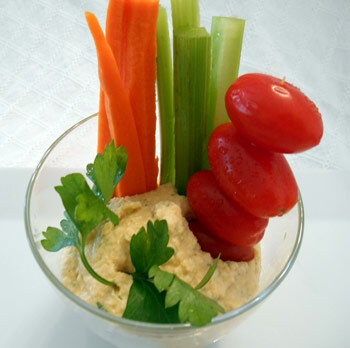 Most children love raw fruits and vegetables which makes it super easy to put a snack or a salad together quickly, especially when combined with a delicious dip or salad dressing. Having a variety of fresh food ready to go is also another way to make healthy choices fast and easy. Organic baby vegetables are so convenient and easy for kids to hold and eat. Also, don’t underestimate how a fun presentation of fruits and veggies can delight a child and make a game out of eating the food on their plates. It doesn’t mean your children will never eat sugar or junk food, but it insures and instills in them a love of real food. 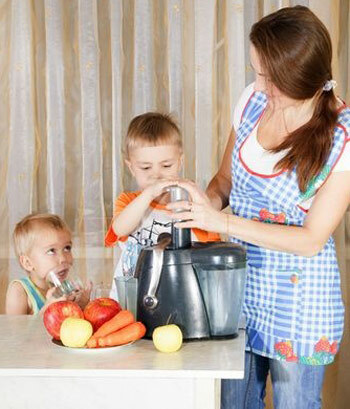 Here are some fast and easy recipes that hopefully will become staples in your child’s diet. The goal is to have your children enjoy nutritious food, which may require sneaking the healthy ingredients in until they decide they actually like it! This slaw is a fresh take on traditional coleslaw. The crispy crunch of apples, sweet potato and the surprise of curry and ginger in the dressing make it especially enjoyable. 1. Add all vegetables into a large mixing bowl and toss well. 2. 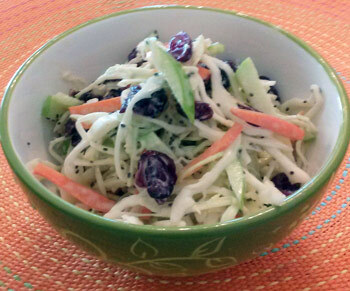 Whisk together the dressing and pour evenly over slaw. Toss well and serve immediately. As an option, I used Artisana Coconut Butter instead of real butter with delicious results! Raspberries can be substituted for the blueberries in this recipe. 1. In a mixing bowl combine the first 8 ingredients and mix well. 2. Whisk remaining ingredients together and fold into dry ones. 3. Preheat a griddle or skillet and pour batter into hot pan by the small ladleful and cook over medium-heat until browned and firm enough to flip. Cook until golden on both side and cooked through. 4. Remove from pan and place in a warmed oven. 5. Continue with remaining batter. 1. Place all ingredients in blender and lightly pulse. Add 2 to 3 pancakes to individual plates and add a tsp. of coconut butter on top. 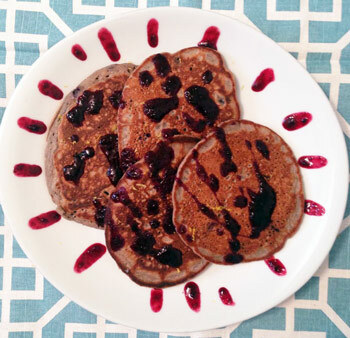 Drizzle blueberry sauce over pancakes and serve immediately. Add extra sauce or coconut butter as desired. 1. In a food processor, add lemon juice, tahini, garlic olive oil and salt and process with the “s” blade until smooth. 2. Add chick peas and process until smooth. You may need to scrape the bowl several times to incorporate all the chick peas. Add small amounts of purified water if necessary to get the consistency right. 3. Add chopped parsley and pulse to incorporate. 4. Pour into decorative serving bowl and sprinkle with a dash of paprika. 5. Serve with sliced carrots and cucumbers around the bowl.